NEW WATERFORD — The village and Crestview Schools recently signed an agreement with a design engineer for the proposed water line to the school campus. Mayor Shane Patrone said the village and school district have been talking about the deal for a year and hired Engineering Associates for the work, a step toward building the three-mile long water line. Fire hydrants will be spaced every 500 feet and there will be at least one pump station to move water to the more elevated school district property, Patrone said last month. The school district will pay for the line. Patrone said they applied for a loan for the engineer and design work from the Appalachian Regional Commission and they expect to apply for grants from the Ohio Environmental Protection Agency and the Ohio Public Works Commission that will be submitted in February or March for construction. “We hope to hear about the loan on December 5,” he said of the design and engineering money. The project is expected to move along the same time line as the multi-million dollar water distribution renovations have proceeded, and village officials are hoping they will know about the Crestview funding in June or July. “We hope to start in the fall,” if that is the case, Patrone said. The line will use the north side of Crestview Road for the right-of-way. 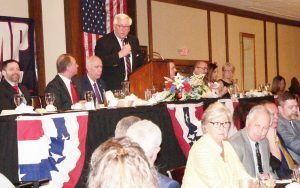 Asked if the defeat Crestview Schools’ bond issue and tax levy in Tuesday’s election would affect the waterline, Patrone said it was a separate issue. In other business, Patrone said the expanded Halloween day the village held was very successful as they moved it from a week day to a Saturday. “Week days are difficult,” he said adding that 240 kids attended and a total of 700 people overall, despite rainy weather, enjoyed the event. Council will meet at 6 p.m. Tuesday in the community building and will have one piece of legislation to eliminate the computer fund from the mayor’s court so the money can be placed directly into the general fund.